This week featured an opposition of the sun to the planet Neptune, which was exact on Friday morning. And this week's news has been filled with sun/Neptune stories. Let's recall that - on one level - the sun stands for royalty, stardom, the king. 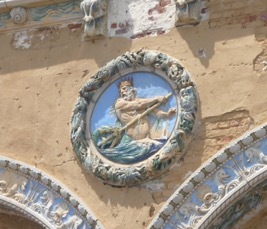 Neptune is associated with illusions, deceptions, drugs, and film. Okay, now let's add it all up... First, Lance Armstrong, certainly the king of cycling, was stripped of his medals by the United States agency in charge of "Anti-Doping." This, despite Armstrong having passed literally hundreds of drug tests during his cycling career. Armstrong described the agency as on a "witch hunt" and with Neptune opposite the sun, that's very possible. Armstrong lost the medals not because he was found guilty, but because he refused to continue to answer charges. That makes him not only a king, but a martyr, and that's very Neptunian. On a side note, Rodney King (a king by name, at least) was found to have died in his swimming pool (Neptune rules the seas) while on drugs (again very Neptunian). Here's a link to stories about how the press is handling the story in Britain.